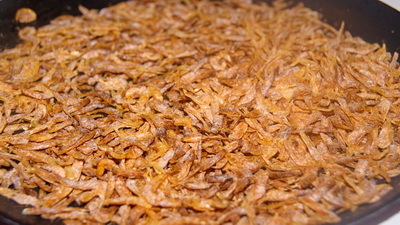 Dry prawn is available in Asian grocery. 1. Roast the prawn and make it powder. 2. 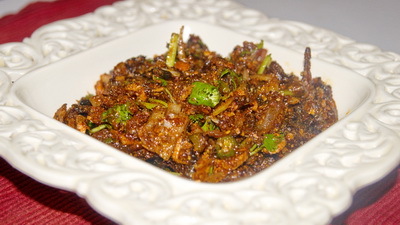 Fry dry chillies in oil and keep aside. 3. In same oil fry 2 sliced medium onions till it becomes golden brown and keep aside. 4. In same oil fry garlic and keep aside. 5. Now mix all things together with mustard oil. 6. Serve chingri shutki bhorta/ Spicy dry prawn mash with hot rice. Thanks. You guys are my inspiration. Hello sister, I tried your most recipe and all turned out Good and my husband likes it. Can you please help me with this borta….. I mean like do I need to wash before fry or what? Please it will be helpful if you can give little more detail that you so much in advance. Hi Nadia! dry small prawn does nt wash. Thanks. Oh okay thank you for your quick reply. I have one more question where can I get it from? Last time I had at his cousin house she said she bought it from bangle grocery but it was sandy you can feel in your mouth. What can I do about it? I never tried from Bengali Grocery. I buy Asian Grocery. if sand in it, it even hard to clean after wash. Best option to make dry prawn by yourself. Just buy small prawn and wash it. put it in a pan and heat it on low. Thanks. Can I make the ‘kachki’ shutki in the same process? 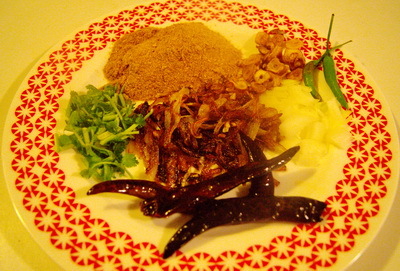 Kachki sutki is usually used in cooking curry . But I think that you can do it with keski. It will be bit smelly though. Thanks. Thank you for the recipe. I think I have to try it out soon, because I am getting really hungry. In our local Bangladeshi/Burmese grocery shops they sell this concoction in bottles (totally dry and flaky, but hot and awesome tasting), and I’m determined to produce this somehow. It is imply awesome; one can add a spoonful of it in a bland soup and change its taste and texture. This is what I call civilized approach to dining. Thank you Ma’am! Please try and let me know your opinion. Thanks.